Maria Cerda and her daughter rally outside LA Unified’s boardroom on June 12. Maria Cerda is an LA Unified parent who advocates not only for her children’s schools but also for the school where she works. Cerda, a cafeteria worker at Sylmar High School and a member of the district’s largest classified workers union, SEIU Local 99, celebrated outside LA Unified headquarters in June when the school board approved a salary increase with their new contract, just weeks after cafeteria workers, school bus drivers, and other classified employees were poised to strike. Cerda’s two children go to magnet schools. 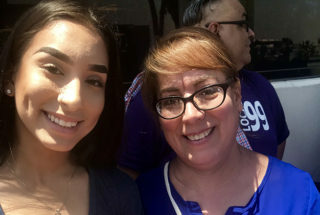 Her son will be in second grade at Haskell Elementary, and her daughter will be a senior at Kennedy High School in Mission Hills in northeast Los Angeles. She had come to the board meeting to advocate for her fellow union members and for the district to approve the contract, which included a salary increase for workers based on their seniority. She said it was time for employees like her — she has worked for the district for 12 years — to be paid more than new employees. Her pay will increase by 4 percent to at least $15.90 an hour. Blanca Gallegos, a spokeswoman for SEIU Local 99, said that after a long, year-plus negotiation with the district, employees like Cerda who have not gotten a salary increase since 2014 will now get a raise of 4 percent starting this school year. Employees with less seniority will get 3 percent for the first year and another 2 to 4 percent the second year. The 3 percent will become permanent if the district has a positive budget projection as of March 2019, she said. The agreement, covering more than 30,000 classified employees, was approved by the board for the next three years. “We also agreed that we will participate in managing a $2 million fund along with the district so more positions can be open and longer shifts,” Gallegos said. Even with an ending balance reserve of $670 million at the close of the fiscal year in June, most of that money will go to employee wage increases — for the classified workers and for teachers, who are expected to get a raise in a new contract — and to cover pension and health care costs, the district’s chief financial officer said at a media briefing on the budget in June. The reserve is expected to run out by 2020-21, when the district is projected to have a $482 million deficit, according to district budget documents. Last Friday, the district also reached a tentative agreement for a three-year contract with the Associated Administrators of Los Angeles. The AALA represents 2,500 certificated and classified school administrators. The contract, which is scheduled for vote by the school board next month, guarantees raises for the first year and wage supplements the second year that can turn into permanent raises depending on the financial health of the district. Contract negotiations with United Teachers Los Angeles, the local teachers union, resumed this week. A spokeswoman for the district had no updates after Tuesday’s bargaining session. Why do you think the wage increase is fair? Many parents like me who work for the district have a salary that is not enough to cover basic expenses such as rent, food, transportation. Because my kids don’t qualify for the school bus, I have to drive them to school every day, and I barely can afford gas. I have been working for the district for 12 years. People like me deserve to earn a decent salary. Even the new employees are making the same as senior employees like me. We even train those new employees and we earn the same. I don’t think that’s fair! In the summer we don’t have a job. In the 12 years I have been a district employee, I have only been employed for two summers. The district offers only a couple hours of work in the summer, and that has a hard impact for our families. Why do you continue working for the district? Obviously, is not for the salary but because I love what I do. I love to serve the students. I really like my job! If not, I would have left a long time ago. But now that they have agreed to give us a salary raise, I think I can stay more years working here. It’s just a little higher pay, but that’s better than nothing. Also, it’s priceless, being able to work for the district where my kids go to school and where I can be closer to them. What would you like the district to focus on for the next school year? As an employee, I’d like to earn more as they have promised us today. I’d like to be treated fairly and that they show more respect for senior employees like me. And as a mom, I’d like that the district goes back to the older policy for magnets so my children could be eligible for the school bus. That would be very helpful for me. It has been very difficult to drive them to school and be on time for my job.